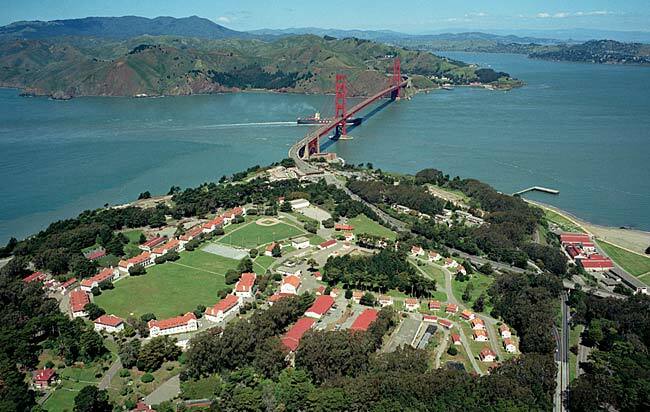 Aerial view of Fort Winfield Scott — the new home of the Presidio Institute — with its buildings encircling a horseshoe-shaped parade ground. When I got my BA in architecture in the mid-1970s, there was a recession. So I became a VISTA volunteer in the underserved Pico Union neighborhood in central Los Angeles. Working as a staff architect in the office of John Mutlow, I helped design a community center and HUD-funded housing for seniors. The experience was unlike anything I’d ever done. The stipend was only about $120 a month, but I loved working with the other volunteers and feeling like we were really making a difference. I did that for a year before getting a more conventional job with an architecture firm. But I came away wanting to keep doing socially important work—mission-driven projects that went beyond just fulfilling the bottom line. That’s why this firm now puts an emphasis on giving back to the community, donating time on nonprofit projects and clients such as the Child Abuse Prevention Center and the Boys & Girls Club. And that’s why one of our recent projects, designing a home for the Presidio Institute, has special meaning for me. 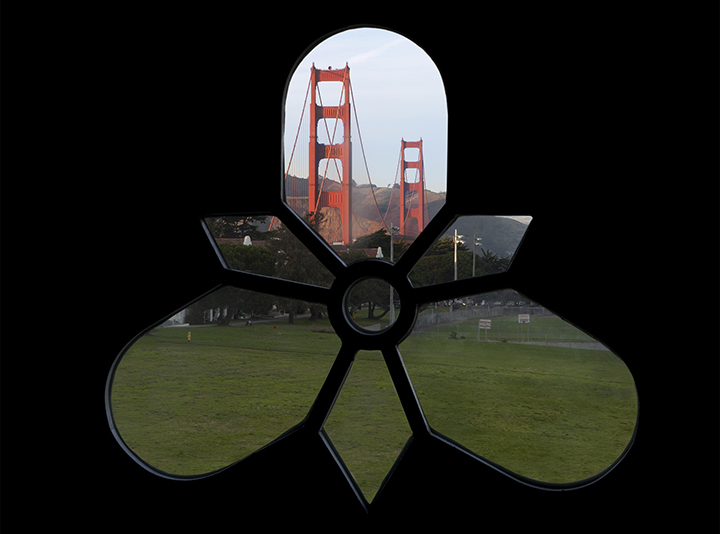 View of the Golden Gate Bridge from the trefoil window in the attic of the Institute’s headquarters. The rendering of this unique building detail serves as the Institute’s logo. 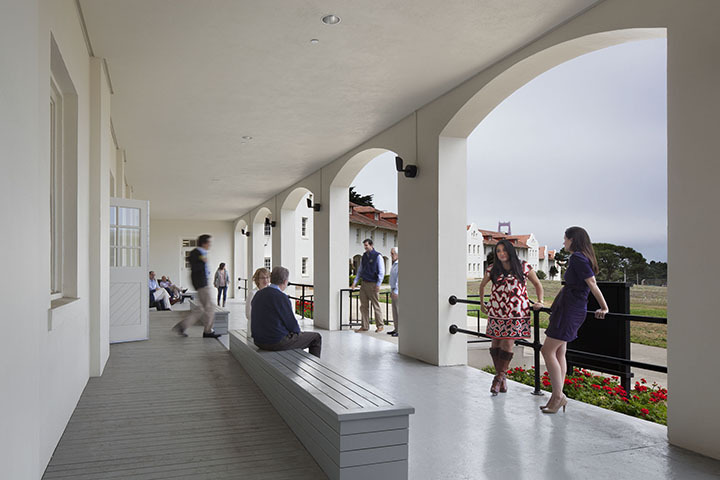 An initiative of the Presidio Trust, the Institute was established to support service-oriented organizations across the country with programs in leadership development, research, and convening. 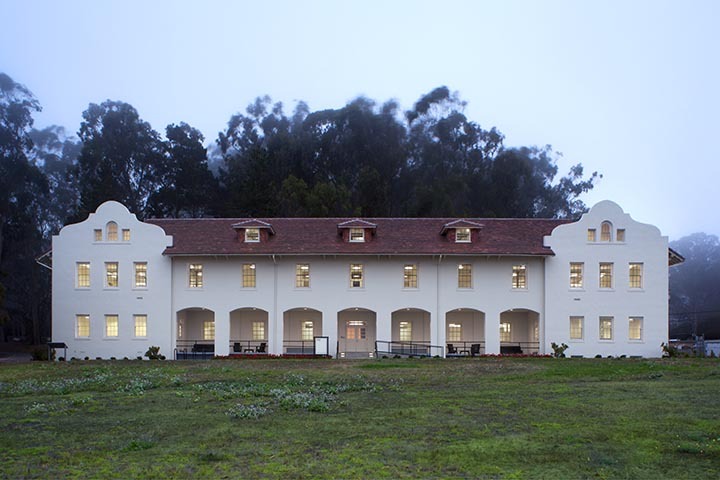 In conjunction with the renovation work we’ve been doing at the Presidio for the last several years, the Trust asked us to perform a capacity study for Fort Winfield Scott in the Presidio’s northwest corner, near the foot of the Golden Gate Bridge, that might serve as a home for this important organization. Fort Scott was built between 1908 and 1912 to support 15 gigantic “Endicott batteries,” reinforced-concrete gun batteries along the coastal bluffs. Construction of the fort meant that Army troops wouldn’t have to march all the way from the main post to get to the batteries. 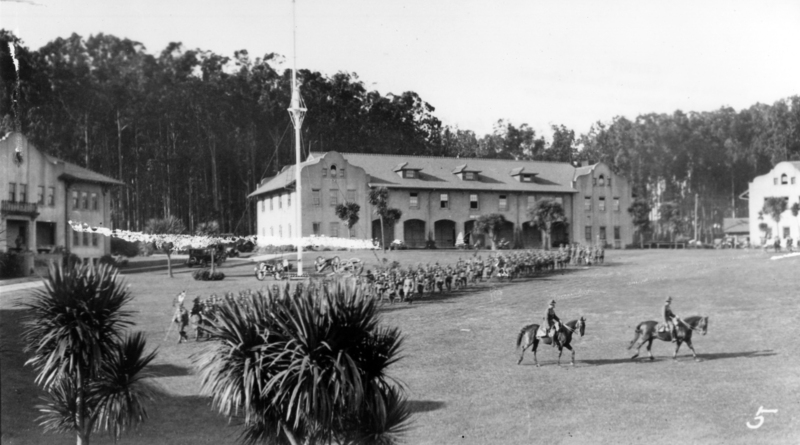 The fort’s structures were the first Mission-style buildings at the Presidio. If you’ve ever seen the Presidio Trust’s logo, that’s Fort Scott, as rendered by artist Michael Schwab. The fort consists of ten identical long, linear buildings organized around a horseshoe-shaped parade grounds, as well as several outbuildings. Most of the buildings are two stories, about 20,000 square feet, including an attic. The capacity study was to help figure out how to convert the buildings into simple hotel rooms, conference facilities, and offices for people attending Institute training sessions. We determined how many buildings would need to be converted in what order and what types of use each one would need to house. The first building, completed last summer, serves as the headquarters for the Institute—appropriate, since it was originally the headquarters for the fort. The LEED Silver-certified project includes administrative offices, classrooms and meeting facilities. Completed in June, the second building houses larger conference facilities and includes lounge spaces, a dining room and a catering kitchen, and multipurpose offices and meeting spaces. The Institute has already hosted conferences, including a forum in September that was co-hosted with the White House. The Trust intends to move forward on converting some of the other buildings into housing as soon as possible, and as more money is raised, additional campus buildings will be renovated. Once about four buildings are repurposed for hotel rooms, the plan is to convert the former gymnasium building into a dining hall. So it will grow over time. When the entire complex is completed, there will be a nice mix of lodging, offices, and conference space to host multiple conferences each year. One of my favorite aspects of the historic buildings are the porches facing the perimeter. 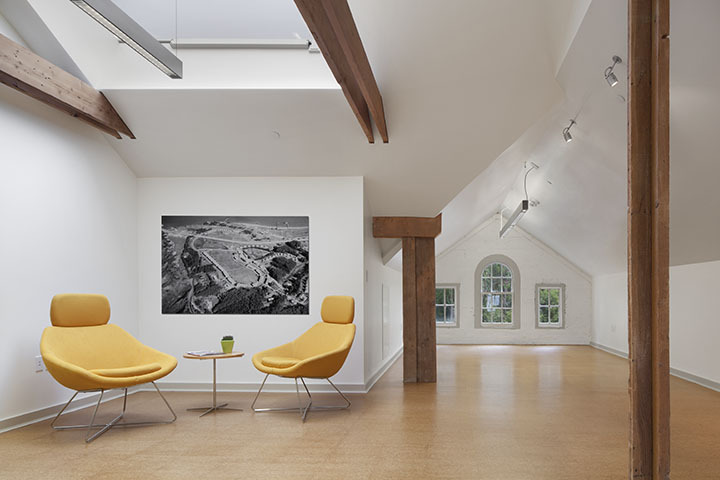 Seven out of 10 days at the Presidio, the weather is foggy, but we incorporated radiant heat into them so participants can hang out and still feel comfortable. When the air is clear, the porches provide awesome views of the bay, the Pacific, and the Golden Gate Bridge, and the natural Presidio landscape. Of course, there are challenges with converting these historic buildings for conference and hotel use. They’re built like a tank—concrete, with steel columns and structures. For conference facilities, you want wide open interior spaces, but the columns are placed every 17 feet or so. We had to work around those—you can’t take them out. It’s tricky to place hotel rooms around those columns, too. 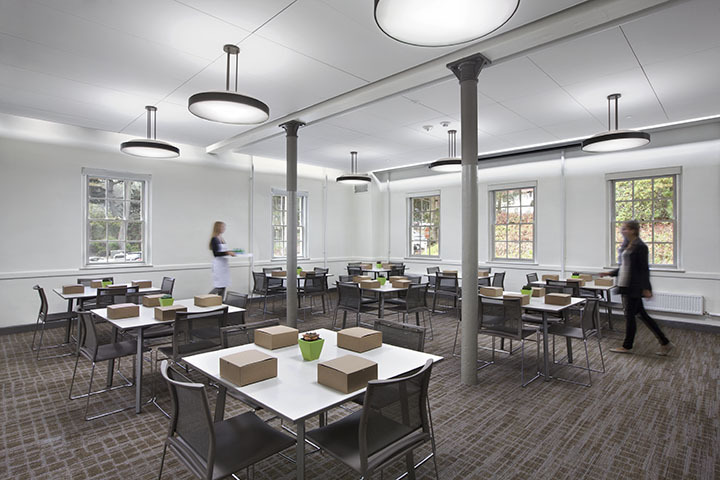 We incorporated radiant heat, natural ventilation, modern electrical and plumbing systems, and a high-efficiency mechanical system, with the goal of achieving LEED Gold. There’s really nothing like the Presidio Institute. The vast majority of nonprofits in this country are too small to provide substantial leadership development. 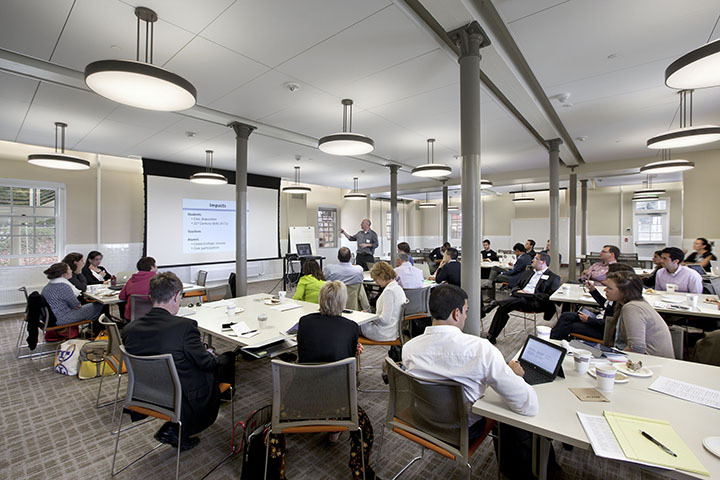 The Presidio Institute creates a place for them to come together, share best practices and research, engage with public and private sector partners, and get training for the challenges they face. We hope this facility and its beautiful setting inspire the people who come here—because they inspire us.